In 2007 Jens Petersen and Brent Campbell enjoyed a canoe trip on Atlin Lake, a journey that included some exploration of the Llewellyn Glacier terminus and surroundings. “I’m absolutely fascinated with Llewellyn Glacier and the entire Atlin area now,” writes Jens. He submitted his 2007 photo along with the ca. 1909 photo, which illustrates about 100 years of change of the Llewellyn terminus. The 2007 photo is used here with the permission of Jens Petersen. The ca. 1909 image is credited to C. R. Bourne and is held by Library and Archives Canada. This perspective looks almost directly south from a low ridge at the southern end of Llewellyn Inlet of Atlin Lake. A trail leads from the campsite on Llewellyn Inlet over this ridge to the glacier forefield and on to the terminal lake and glacier terminus. Learn more about the area via the Atlin Provincial Park website. 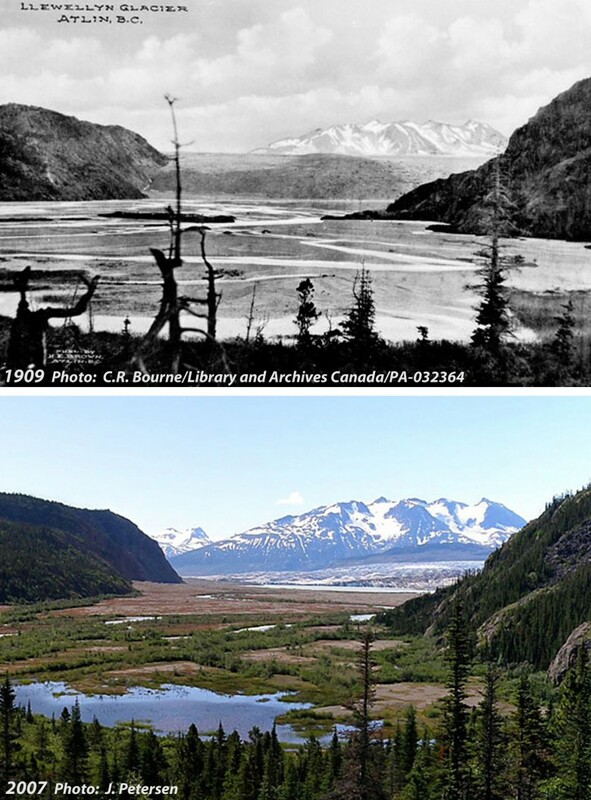 In 1909 the surface of Llewellyn Glacier was well up the bedrock ridge/mountain on the left in the image above. The elevation of this surface position – marked clearly by the current trimline – is approximately 900 m, while the present day lake surface is at an elevation of a bit below 700 m. This thinning of some 200 m over the past century is dramatic, but not uncommon for the terminus of a large glacier in the Coast Mountains of British Columbia and Alaska. This thinning, and ultimate recession away from this bedrock ridge was the trigger of a “disappearance of a glacial river” in 2011. Thank you for submitting your photography to GlacierChange.org, Jens!